Nematoda is a phylum of simple, primitive creatures called nematodes. Some species exhibit free-living lifestyles, but most are endoparasites that live part of their lives inside a plant or animal called a host. Some nematodes cause illness or disease, whereas others are essentially harmless. Though exceptions exist, most nematodes progress through seven steps in their life cycle: eggs, four larval stages and two adult stages. Because they are such a diverse group, nematodes exhibit great variation in terms of biology, habitat and the subtle details of their life cycles. Approximately 12,000 species have formal scientific names, but this likely represents a very small fraction of the total species inhabiting the planet. According to zoologist Phil Myers of the University of Michigan, the total number of species may be as high as 500,000. Scientists find nematodes in shockingly high quantities, and have found as many as 90,000 individuals living in a single apple. Often, nematodes release their microscopic eggs with an animal’s feces. Doctors, scientists and veterinarians examine animal droppings to find these eggs and diagnose the nematodes living inside a given animal. The eggs of some species, for example, human pinworms, spread as they blow around with dust and debris. Most nematode eggs will not reinfect their definitive host -- they require an intermediate host, in which they develop through one or more larval stages. After hatching from their eggs, nematodes undergo one or more pre-parasitic larval stages. After hatching, the larvae consume bacteria until growth necessitates molting. After their first molt, nematodes enter their second larval stage. During this time, some species exhibit a free-living lifestyle, while others inhabit an intermediate host. In most nematodes, the third larval stage -- after the second molt -- is the infective stage. 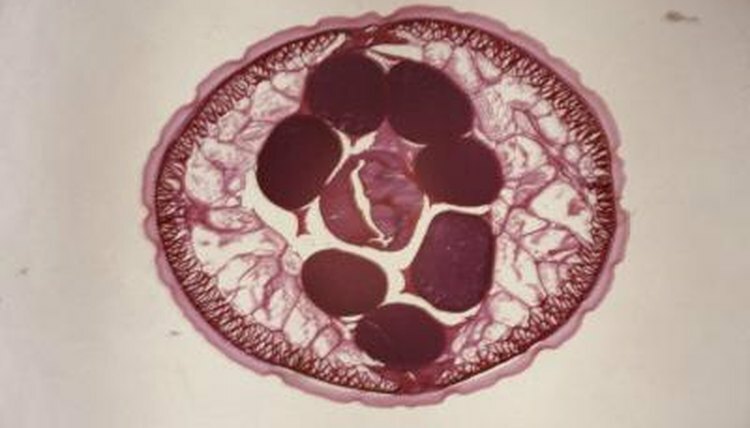 A 1992 study of Heterorhabditis bacteriophoras -- nematode parasites of insects -- found that when overcrowded, these nematodes skipped the final pre-parasitic stages in their life cycle and proceeded directly to the infective larval stage. The study, published in “Journal of Nematology,” found that when this step was skipped, the adults were usually hermaphroditic, and only began producing males during the second generation. The adults of many species resemble worms, earning them the colloquial name “round worms.” As they lack cilia or flagellae, these worm-like organisms move by flexing their body back and forth. Most nematodes are dioecious as adults, meaning that they occur in both male and female forms, and reproduce sexually -- usually inside the body of the definitive host. In contrast to the sperm cells of most animals which propel themselves with flagellae, nematode sperm cells move via pseudopods, like amoebas do.